Cholesterol clefts in a male B6C3F1 mouse from a chronic study. 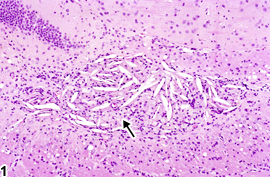 A mature degenerate focus is represented in Figure 1 (arrow) consisting of gliosis, macrophages, and crystalline-shaped cholesterol clefts. This small resolving degenerative lesion is adjacent to the dentate gyrus of the hippocampus. The most striking feature is the empty elongated spicular spaces formerly occupied by cholesterol crystals, often referred to as cholesterol clefts. Tissue processing with solvent has removed the cholesterol. Associated with cholesterol clefts are many mixed glial cells and macrophages. This type of process is usually the result of brain necrosis with liberation of myelin proteolipid complexes or from phagocytosis of extravasated blood or degraded cells in chronic inflammatory processes. The degraded lipid from lysed cell membranes results in intracellular accumulation of free cholesterol and triacylglycerol, along with other compounds. Apoptosis of macrophages results when they are loaded with these latter compounds and the usual cellular safety mechanisms preventing excess free cholesterol accumulation fail. The macrophages release free cholesterol, which precipitate as crystals in the adjacent tissue. These cholesterol crystals remain in the tissue for prolonged, often lifelong, periods. The striking appearance of cholesterol crystals in brain tissue should be recognized usually as a component of the response to pre-existing brain necrosis, chronic inflammation, or hemorrhage. Cholesterol clefts, when present, must be diagnosed in NTP studies and the subsite recorded. In the presence of concurrent lesions, lesions with the most severity are typically diagnosed. Other concurrent lesions may be diagnosed separately, if warranted by the severity. Aflaki E, Radovic B, Chandak PG, Kolb D, Eisenberg T, Ring J, Fertschai I, Uellen A, Wolinski H, Kohlwein SD, Zechner R, Levak-Frank S, Sattler W, Graier WF, Malli R, Madeo F, Kratky D. 2011. Triacylglycerol accumulation activates the mitochondrial apoptosis pathway in macrophages. J Biol Chem 286:7418-7428. Tabas I. 1997. Free cholesterol-induced cytotoxicity. 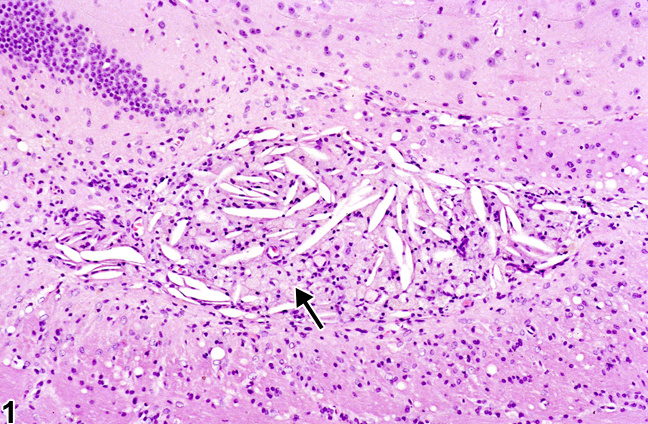 A possible contributing factor to macrophage foam cell necrosis in advanced atherosclerotic lesions. Trends Cardiovasc Med 7:256-263.